Front row (left to right): 1. unidentified, 2. unidentified, 3. unidentified, 4. unidentified, 5. unidentified, 6. unidentified, 7. unidentified, 8. unidentified, 9. Tom Reitz. Second row: 1. unidentified, 2. Beverly Spears, 3. unidentified, 4. unidentified, 5. unidentified, 6. unidentified, 7. Carol Cragholm, 8. unidentified, 9. unidentified. Third row: 1. unidentified, 2. unidentified, 3. unidentified, 4. unidentified, 5. Janet Meyers, 6. unidentified, 7. unidentified, 8. unidentified, 9. unidentified. Fourth row: 1. unidentified, 2. unidentified, 3. Carl Cragholm, 4. 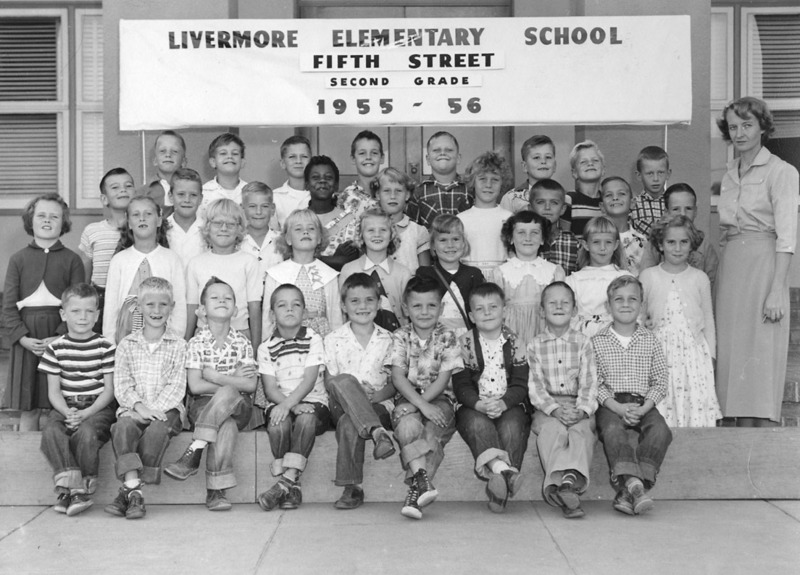 Steve Swanson, 5. Dan Dailey, 6. Henry Pumroy, 7. unidentified, 8. unidentified. Credits: From the collection of Tom Reitz. Scanned by Brian McFann. Original Photograph by David's Studio. Thanks to Tom Reitz and Robert Mills for identifying the kids in the picture.